Whether you’re a local or visiting Pensacola for the weekend, you’re going to want to visit Pensacola’s Photo Trail. 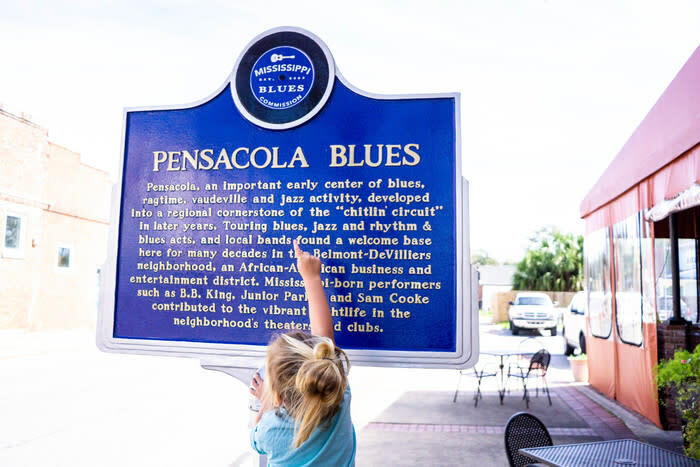 This collection of the city’s most recognizable places will take you back to Pensacola’s founding, over 450 years ago, through many generations and all the way to present day. Stroll through pristine nature trails, walk in the footsteps of historical figures, become familiar with local artists, eat fresh seafood, cool off in the ocean, and even enjoy a little bird watching. 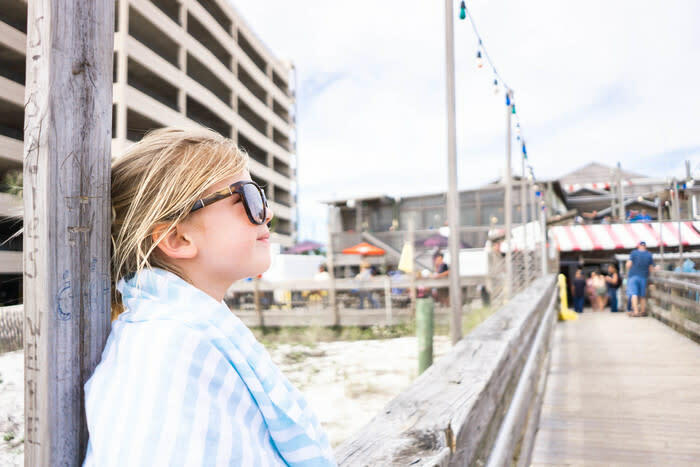 This weekend itinerary will take you and your family on a two-day adventure that begins in Florida’s ecological swamp land and ends with you relaxing on one of the country’s most beautiful waterfronts: Pensacola Beach. So, grab your camera and let’s get started! Beat the heat with an early morning walk on the Edward Ball Nature Trail, located in north Pensacola near the University of West Florida campus. Here you’ll find a picturesque view of Florida’s unaltered wild side, a quiet escape beneath the shade of old cypress trees. This walking/hiking/mountain biking trail is friendly for all ages, features a short boardwalk through a ravine and swamp, and flows in an easy one-mile loop! Now that you’ve got some exercise in, head to Five Sister’s Blues Café in the Belmont-Devilliers district to grab a hearty Southern brunch and learn about the Mississippi Blues Trail. An early center for blues, ragtime, vaudeville and jazz activity before the Civil Rights movement, the Belmont-Devilliers district came to life through music and developed into a regional cornerstone as the “chitlin’ circuit.” From B.B. King to Sam Cooke, touring acts and local musicians found a welcome base in this African-American business and entertainment district for several decades. It’s time to head downtown! Snap a pic outside the T.T. Wentworth Museum and then head indoors to learn all about Pensacola’s storied history. Discover how the City of Five Flags was first settled 460 years ago by Spanish explorer Don Tristan de Luna, all the way to present day times and how Pensacola has made its mark on people from all walks of life. After submersing yourself in Pensacola’s rich history, meander outside the Wentworth Museum to the Cubed Gulf Coast project. Here, Pensacola celebrates creative minds by featuring 16 artists who transform their works into four 8&apos;x8&apos; cubes, each side presenting a different work of art. Don’t forget to take a selfie and use #cubedgulfcoast! 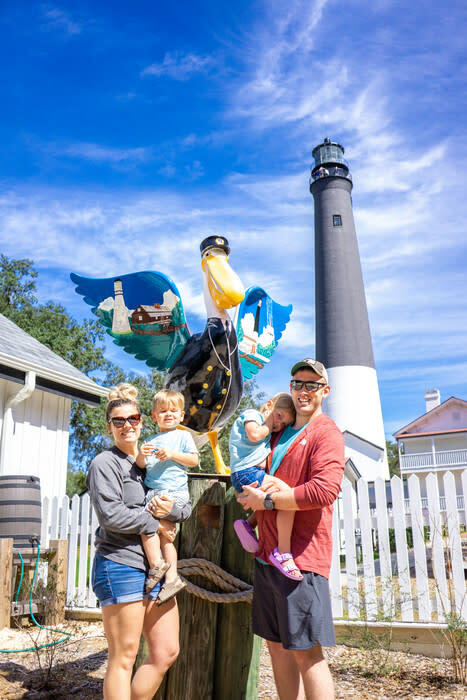 Now that you’ve stretched your mind and imagination, it’s time to take a walk down to Palafox Pier where you’ll find an iconic Pensacola Pelican welcoming you, amazing views of Pensacola Bay, the Plaza de Luna monument and statue honoring our city’s founding father, and some ice cream to satisfy your sweet tooth! In the spring and summer, be sure to bring swimsuits for the kids so they can cool off in the plaza’s public splash pad. Next up: Head to the famous Joe Patti’s Seafood Market! For over 75, years Joe Patti has served the city of Pensacola with the finest seafood. You can snag some for yourself! From freshly caught Gulf shrimp and red snapper to homemade gelato, Joe Patti’s will please the entire family. Make sure you try the fresh crab dip, steamed shrimp, fresh rolled sushi and some deli sandwiches for lunch. Enjoy your lunch on the pier or at a picnic table outside of Amangiari’s Deli. Travel further west to the iconic Big Lagoon State Park near Perdido Key, which features narrow beaches, over five miles of hiking and shallow bays to wade in. You can even rent a kayak or paddleboard by the hour. Head to the East Beach observation tower for some incredible views of Perdido Key and the Gulf and to spot osprey and eagle nests! As a final stop to round out your first day on the Photo Trail, head to the famous Flora-Bama! This downhome waterfront bar, located on the Florida and Alabama state line, serves up a lively atmosphere and plenty of blended drinks on a pristine beach overlooking the Gulf. The Flora-Bama is the perfect place to end your day sitting with toes in the water, a cold drink in your hand, and, well, you know the rest! Start the morning with a cup of coffee and a photo op! 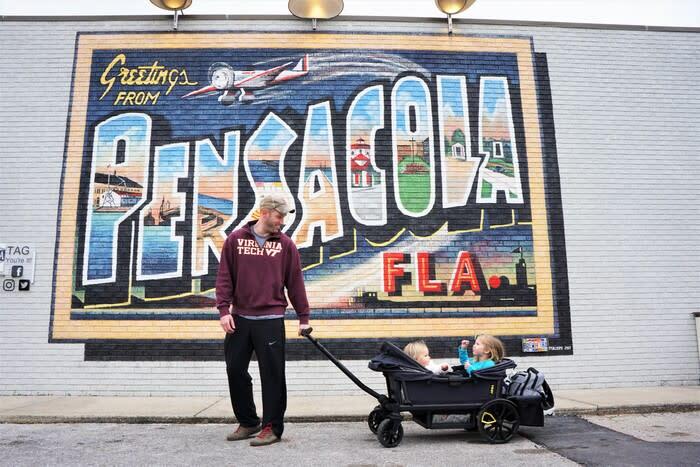 Situated in the iconic East Hill neighborhood on the side of Brew Ha Ha restaurant, the Pensacola Postcard has quickly become one of Pensacola’s most photographed spots! You’ll want to get there early before the restaurant opens and parking fills up in front of the mural! Once you’ve snagged your epic postcard photo, it’s time to head toward the beach! Along the way, stop at Pensacola’s famous Graffiti Bridge! This ever-changing bridge is re-painted almost daily. You’ll find marriage proposals, tributes and sports highlights painted there. It’s a place of expression, celebration and remembrance. Once on the island, the third stop of the morning is out of this world. Literally. 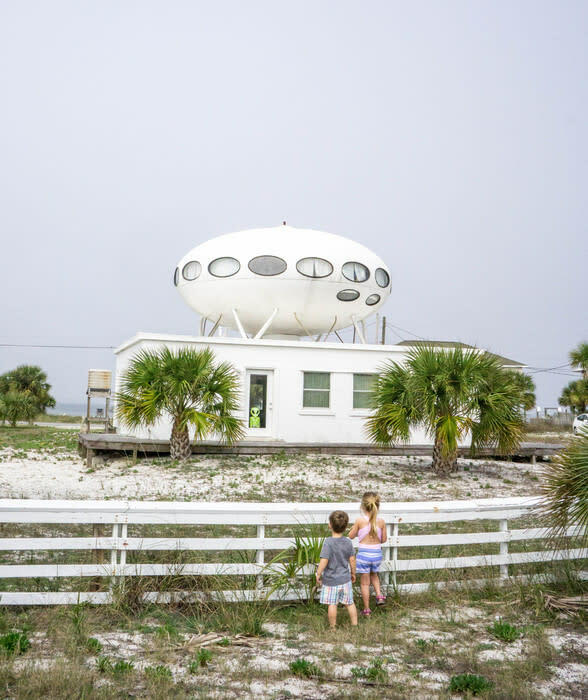 Pensacola Beach’s very own UFO Spaceship House is located at 1403 Panferio Drive and has become a beach landmark! The beach’s very own flying saucer house has resisted lift off for four decades. See if you can spot the alien living inside! Finally, it’s time to spend the day relaxing on Casino Beach. Here you will find TWO of the photo trail’s iconic spots: the infamous Pensacola Beach Ball water tower and the Pensacola Beach Pier. Stroll the 1,471 feet of the fishing pier for a spectacular view of the island, stopping along the way to check out the sea life in the pristine waters below. Or, just sit and relax by the shore and take in the incredible view. With plenty of restaurants around, you can eat, drink and be merry as long as you’d like! After your weekend adventure you will be well versed in Pensacola’s history, food and love affair with the outdoors. But trust me, the Pensacola Photo Trail is just the tip of the iceberg for all that Pensacola has to offer. So you might as well leave your calendar open for another visit to Florida’s Gulf Coast. Remember to use the hashtag #ExperiencePcola to be a part of the Pensacola Experience and for an opportunity to be featured on Visit Pensacola’s social media pages and website! Tavia has been a Pensacola resident for two years. She and her family love the soft white sands and clear water here on the Gulf Coast. Tavia is a military spouse and mother to two children. She spent five years as a Civil Engineer in the U.S. Air Force but left the military to focus on raising her family. In early 2016, Tavia started the family travel blog, Big Brave Nomad. Since then she has explored 14 countries and 25 states with her kids, sharing the adventures along the way. On her blog, you will find city guides, packing list and helpful information on traveling with kids in tow.